Update your wardrobe for £100! It's that tricky time of year when the sun finally starts to shine but you can't put away your winter coat quite yet! If your winter clothes are feeling dull and you're looking for a few versatile must-haves to fill the gap before it really warms up, then take a look at my 5 transitional key pieces for an amazing £100! They make a fab outift but are also easy to mix and match with your current wardrobe too. Happy shopping! 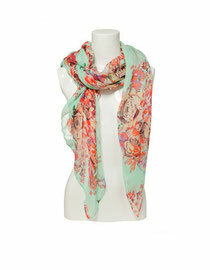 A simply stunning floral printed scarf from Zara for £17.99 - nothing more to say on this one! The wedge is the shoe of the season and in tan makes it the most versatile shoe around! Wear these tan peep toe wedges from New Look (£19.99!) with bright skinny's, floral dresses, denim mini's - whatever takes your fancy! Add some bright nail polish on your toes to complete your look! A client bought these on a personal shop and I am totally in love with them. Zara do these zip hem skinny's (£24.99) in lots of colours but this is definitely my favourite. They are a pinky/red colour in a brushed denim which gives them a softer look. Wear with a stripey T-shirt for a nautical feel or with pastels to do one of the key trends of the season. This has got to be the best value basic of the season! This scoop neck woven T-shirt from H&M is an unbelievable £6.99! Suits any shape as it skims your curves rather than clinging and the deep scoop neck works for any size bust too. Don't hang about, they won't last long! If you don't already own a trench then now's the time to invest! This is the pefect time of year to put your duvet coat away and bring out a fresh lightweight mac like this gorgeous trench from H&M for £29.99! Not only are they super chic and timeless but they seem to go with anything! Wear with bright skinny's for a cool casual look, over your work suit for a chic edge and even works with a glam dress and heels. Click here to return to main blog page.